Hello! I just got back into town after a crazy, tiring and fun spring break. 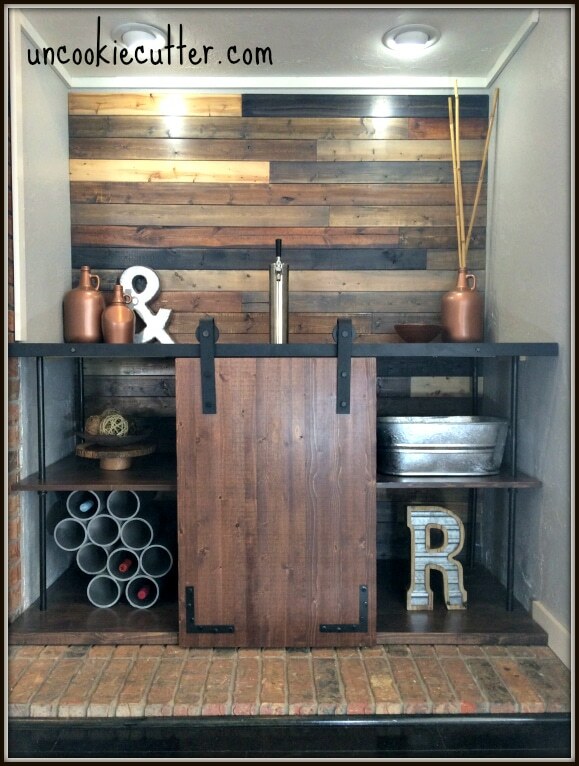 I just wanted to share a quick and easy little upcycle that I did for my new bar area. 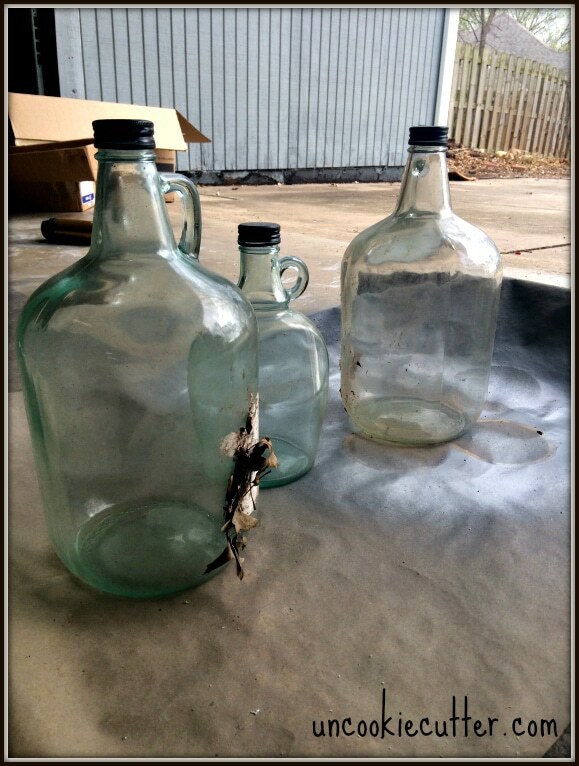 A while back, I found some cool looking glass jugs in my front courtyard. We are working on this area and I found them hanging out under one of the overgrown bushes. I’ll pulled them out, not knowing what I was going to do with them. This page contains affiliate links. If you click on a link and buy something, I get a small percentage at no extra cost to you. Sometimes I think about stuff for awhile and come up with something really cool, but sometimes a simple little upcycle is best. All I did was clean these vases up and sand them very lightly. And I had some of this lovely Rustoleum spray paint for another project and then decided not to use it. I love, love, love this paint. It works so well. There is a trick, however. You do have to go very lightly. I spray a light coat on, let it dry (20 min or more should work), then did probably 5 more very light coats. I used it until the can was gone – one can was perfect amount for 3 glass jugs. Then I put about 3 coats of this stuff to help prevent the paint from chipping off the glass. That’s it! 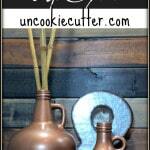 An easy, effective and best of all – FREE(because I had all supplies on hand) upcycle. I’ve seen glass jugs like this at thrift stores all the time, so if you like the look you could probably find them pretty easily. Hobby Lobby always has nice glass jugs, and if you find them on sale, they are very cheap. 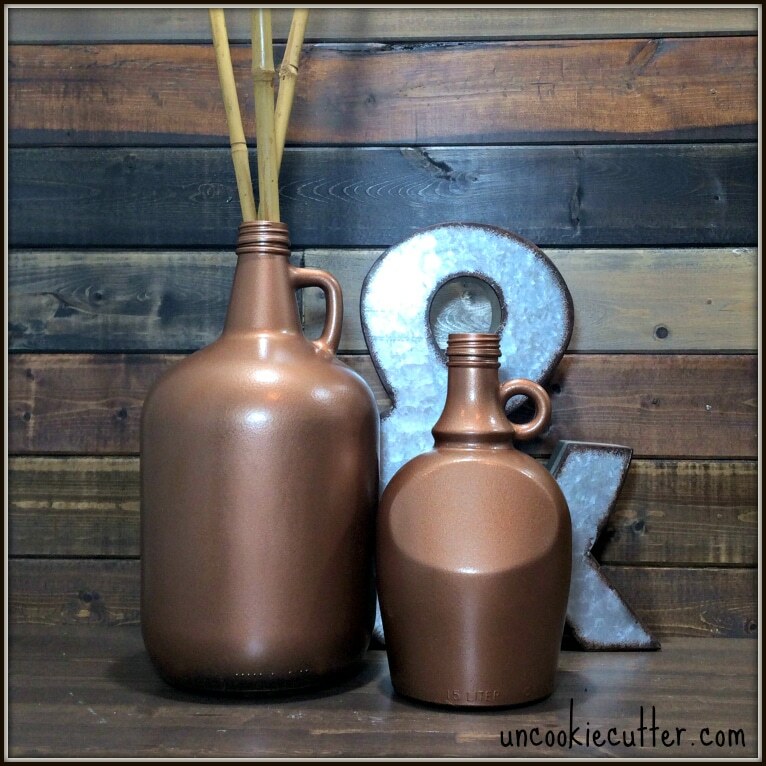 Or, you could use old liquor or wine bottles! 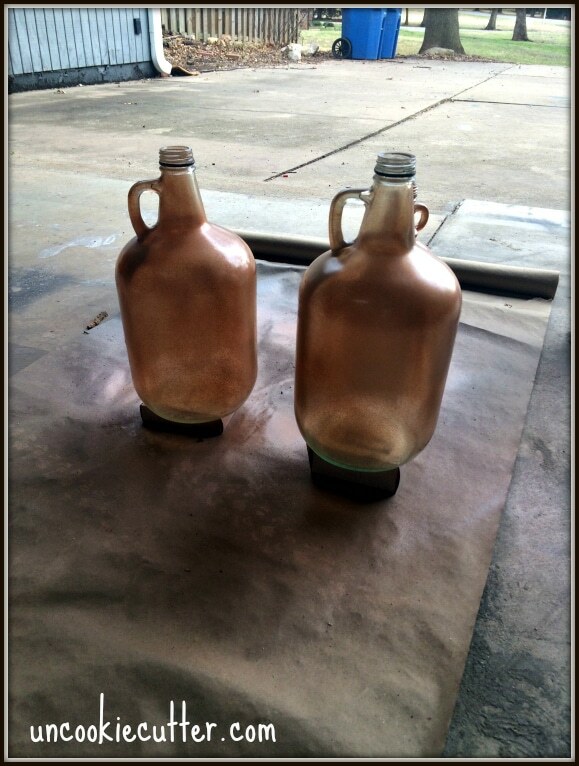 I used the jugs in my new bar area, which is coming along nicely. I did run into some snags installing my sliding door, which you can read about HERE. Nice project and I love the result!! Your jugs look nice up against the wood plank wall. I did not know that Minwax came in a spray can. 😀 Fantastic! I can’t believe that it’s so easy and creative. Many many thanks for sharing! These are beautiful! Love that coppery color. 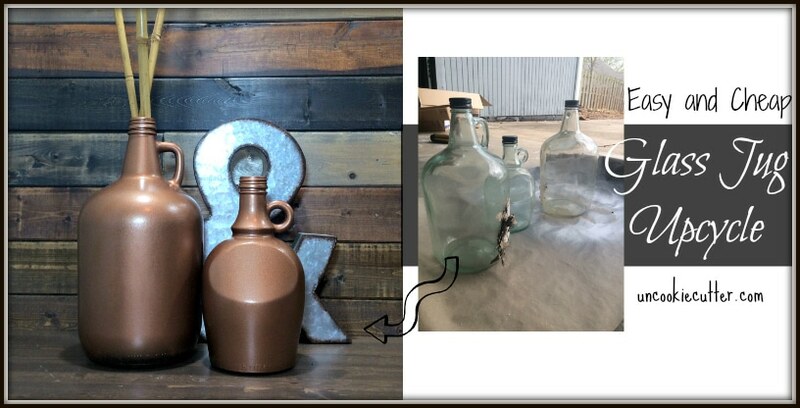 Thanks for linking up with Creative Spark; I chose your upcycled glass jugs as one of my Features for this week’s party. Hope you have a great rest of your week! Thank you so much Emily! So excited to be featured, this was such an easy project. I just linked up, thank you so much!